During exploration of high availability (HA) features of Windows Server AppFabric Distributed Cache I needed to generate enough load in a short timeframe. You know, to kill a couple of servers. This is what came out of it. I talked about this at a recent Users Group meeting, doing a live demo of cache clusters under load. 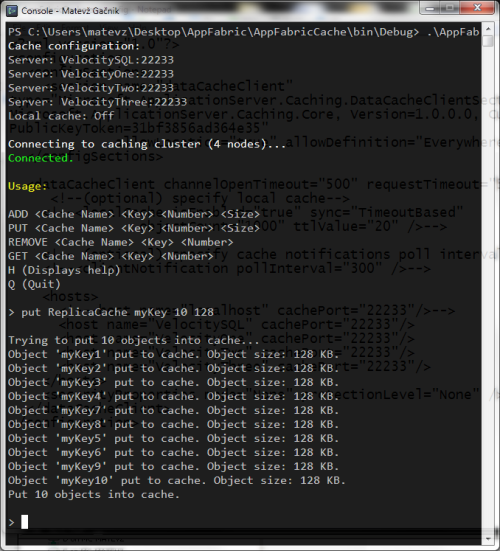 Since AppFabric currently supports only partitioned cache type, this will distribute load among all cluster hosts. Thus, all hosts will store 1/N percent of objects. Since cache is in HA mode, you will get all your objects back, even though a host is down - cluster will redistribute all the missing cache regions to running nodes.